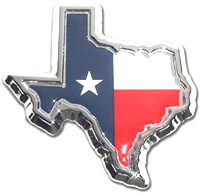 State of Texas Flag car emblem. UV resistant domed flag set in metal chrome frame. Paint safe attachment with double sided 3M automotive foam tape. Made in USA. Size: 3" x 3" FREE SHIPPING!